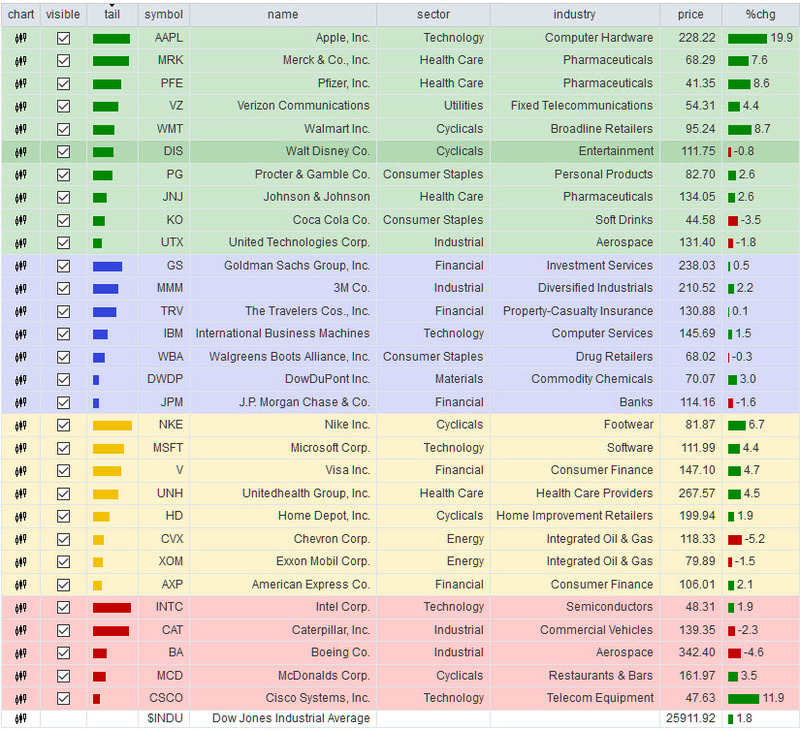 In this post I look at the Dow leaders, laggards and names on the move. I also provide some commentary and key levels for several names. Although much of the recent buzz has been on Tech ( and rightly so ) I was curious about how the Dow names were performing. 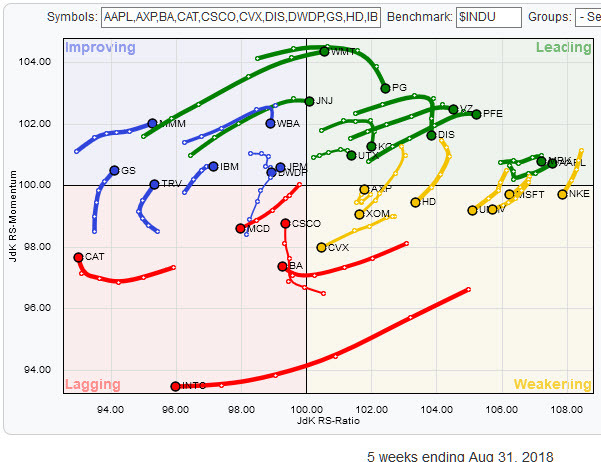 Pictured below is the 5 week Relative Rotation graph and Performance table using $SPX as the benchmark. As you examine the findings, keep in mind that the length of the tail of each stock represents the speed of the move. Additionally, remember that this study presents relative rotation and performance based upon relative strength and momentum. Just because a name is “lagging” doesn’t necessarily mean the stock is going down. It just means that it is lagging peers and the benchmark. $MRK – Last week the stock printed a gravestone doji on the weekly chart which is never a good thing. Additionally RSI and momentum beginnng to roll over. I’d expect a test of the 20ema near term. $VZ – Hit a wall at $55. A re-test and hold of the recent breakout at $53.50 would give a nice objective long entry location. Below $53.50 gets iffy . $DIS – Has pulled back and is re-testing the $111.75 – $112 breakout level. Needs to hold here or a test of the rising 50ema around $110 seems likely. $PG – Recently hit a huge wall of resistance at $84. If you’ve been long since the turn up in May, I’d consider booking that win. Getting through $84 looks tough, but if it does, certainly a bullish development. $UTX – Blue skies above $136 but after 2 rejections at that level, a double top scenario is a distinct possibility. $GS & $JPM Both have hit key resistance zones. Better places to look for outperformance IMO. Not a huge fan of the money center banks at the moment. Regional Banks look much better. $MMM – Filled the gap from late April and now currently sits around $210. Traders can stay long against the 200ema at $207.50. Below that I’d be cautious. $TRV & $WBA – Both Stocks have been in a downtrend. 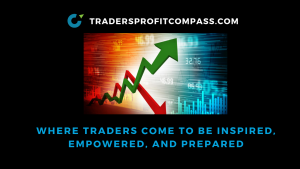 I interpret the recent action as a counter trend rally. The 200ema’s are close by and I’d use those levels as a stop if you’re long. $XOM & $CVX Not a big fan of either at the moment. More inclined to sell below the 200ema rather than be a buyer. Oil within striking distance of recent highs yet these two can’t get much going. Refiners are performing much better with an expanding crack spread. If interested, you can read more about it HERE . $HD – A move above $203 with some conviction will get this going. A nice place for an objective long. $CAT & $BA Expect further weakness if the anticipated additional tariffs on $200 B of Chinese Goods kicks in late next week. There you go traders. Hope it helps.